Hearts head coach Robbie Neilson hopes either Hibernian or Rangers join them in the Scottish Premiership next term. However, he said he has no preference as to which side he would prefer. Hibs, Rangers and Queen of the South currently occupy the Championship play-off spots. The final will feature the top flight's second bottom side. "It doesn't bother me either way to be honest. I'd probably prefer either Rangers or Hibs to go up financially for the club," said Neilson. "The fans love a derby, but they love it when Rangers come here as well. Either way I'm not too bothered." Hearts, who clinched the Championship title last month, visit Alan Stubbs's Hibs in the season's final Edinburgh derby on Sunday. "I think they've done really well this season," said Neilson of his city rivals. "I think Alan's done a great job. "Difficult from the start of the season obviously, with the relegation they had in the last minute in the play-offs [last term]. It's always hard - he lost a lot of players but built his squad. "They had an up and down season, they had some fantastic performances, good runs and then some difficult periods as well, so I think he's done a great job and it's going to be an interesting close to the season once it goes to the play-offs." Hearts are unbeaten against Hibs in the three games played to date this campaign, but lost their second league match of the season last weekend in a 2-1 defeat by Rangers, and needed a last-minute equaliser to gain a point on their last visit to Easter Road. 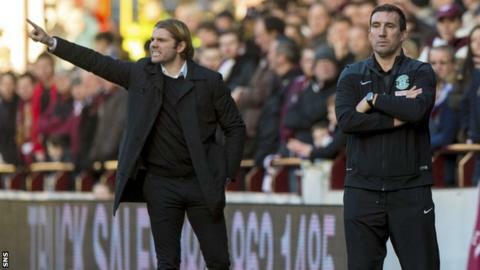 "We're looking forward to it," said Neilson, who has been named Championship manager of the month for March. "We're bringing a full allocation down, so we're hoping to go down there and put on a performance. "We just have to win it. I spoke to the players about it, it doesn't matter where we finish in the league, how well we've done in the league, if you don't win the derby match then everyone's flat." Hibs will not give Hearts with a guard of honour before the match as Rangers did at Ibrox, but Neilson insists it does not concern him. "It can work against you as a team," he added. "Sometimes it distracts the players when they come out. It does give the opposition the means to try and beat you or a motivation to try and beat you. "If teams want to do it then great. If not, it's up to them, it's here or there to us. "Rangers did it which was fantastic it, but I think it lost our focus a little bit, we started the game poorly."